This Hollow Body offers any of us on a budget a taste of Gretsch with a bit more oomph. Tidy build, satin finish, additional P-90 at neck and standard sized Broad’Tron ’bucker. It’s built to a budget and needed a little nut work to ensure the Bigsby stayed in tune; not for vintage snobs; just the one colour. It’s not always easy to drag a heritage brand into the modern age, but Gretsch - certainly in recent years - has been doing it rather well. Its Players Edition adds numerous player-centric tweaks and the range is a good foil to the ‘don’t-touch-me-I’m-vintage’ Vintage Select models. The Electromatics have recently been upgraded and, until the launch of the Streamliners back in 2016, were the entry-point to those wanting that look without those prices. A couple of years on and the Streamliners are not quite as affordable as they were, but even at their quoted RRPs (and no doubt lower street prices) they offer, on paper at least, substantial bang for yer ol’ buck. Not only are they perfectly good guitars, but they also make for prime modding material, not least because the original models all featured the Broad’Tron humbuckers. These not only provide a more contemporary ‘beefed up’ Gretsch-y voice, but with a standard full humbucking size, there are trillions of retrofit pickups to choose if you want to change their flavour. However, with a pair of recently released Limited Edition models (limited to 300 pieces each in Europe), it seems Gretsch has been modding them for us. 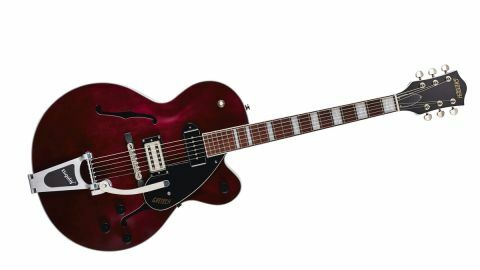 Both new models add a P-90 and come in smart satin colours - only one per model, though - which make a welcome change from the plethora of over-glossed Asian guitars. Our 16-inch (406mm) wide hollowbody G2420T-P90 is a close cousin of the standard Streamliner Hollow Body, which is offered with a Bigsby or a trapeze tailpiece. Our limited model is Bigsby-only, a licensed B60, and comes in quite a moody-looking Midnight Wine Satin. Finish aside, however, its raison d’être is the neck-placed ‘dog ear’ P-90 single coil, which nods towards the G6120 Eddie Cochrane that pairs a similar-style neck pickup with a Dynasonic single coil at bridge. Here, however, we get one of those aforementioned Broad’Tron ’buckers. Entry-level it may be but Gretsch’s classic laminated construction, with proper kerfed linings, is replicated here with nice touches, not least the ‘secured’ tune-o-matic bridge, which sits on a wooden foot on the Hollow Body. There’s a vintage style to the simple black knobs and, although the rosewood fingerboard is bound and features a big pearloid block inlay, it doesn’t look over-blinged like some classic Gretsch models. The Hollow Body features a ‘Slim U’ neck and nut width that deep that by the 9th fret before the neck curves into the relatively shallow heel. It has a substantial, full-shouldered D shape that measures and feels slightly bigger than an original-release Streamliner Hollow Body that we have for comparison. It has a nicely dialled in setups, though, approximately 1.6mm on both treble and bass sides, and with this style of small fret you certainly get to feel the ’board. The weight is also light. The Hollow Body’s depth means it sticks out some way and obviously there’s considerable acoustic volume from the Hollow Body - plenty enough for practice even with another acoustic guitar player. It uses Gretsch’s Tone-Pot control circuit and from what we hear we’d guess that the master volume has a treble bleed cap - the sounds remain pretty clear as you pull that down, while the individual volumes remove a little high-end when pulled back, as well as some thickness. It would be easy to plug in this Hollow Body and ask, ‘Where’s the Gretsch?’ Initially, it appears quite a dark, moody voice that hints at those late 50s/early 60s jazz/ blues sounds on the neck P-90, but needs a little more presence, and with only the pole pieces to adjust in terms of height (unless you add another shim) you’ll lose some of the P-90’s girth. That said, it’s worth spending some time here. Not only did the nut grooves need attention but slight tweaks can reap rewards, although the rather-too- dark bridge pickup holds us back from the snap and sizzle we were expecting. But as we listen and compare with other semis, we begin to find much more. The pickup volumes, especially on the bridge, thin the sound enough to get us into the right ballpark, especially if we pull back the master volume, too (and kick in a level boost from our pedalboard). Reverb and a hint of slapback and/or tremolo just about gets us there. The softer voice of the neck P-90 is helped by raising those poles a little. The tone control could certainly help a little more, though; with the pickup volume up it has quite a slow, subtle roll off that then suddenly dives to a muted woof. Pull the volume back, though, and it’s a lot less effective. Still, true to Gretsch, there’s always an idiosyncrasy or two, isn’t there? Aside from needing a little more attention to the Hollow Body’s nut and the general bedding in of the Bigsby (like the original 2016 Streamliners), this is a perfectly well-built guitar for the money. It offers any of us on a budget a taste of Gretsch with a bit more oomph. These Broad’Tron pickups don’t immediately capture that sound, but work at it a little and you can get close. That said, the P-90s gives this guitar arguably more validity turning the Hollow Body into a slightly more characterful and jazzier or Texas swing kinda piece.